Our new user acquisition suite offers several tools to help you understand your competitors’ advertising tactics and make yours more effective. This page displays the top 100 advertisers by share of impressions for each store in every category. You may sort by specific network as well. We track the top eight mobile app advertising networks. Facebook and Instagram tracking are coming soon. This page also enables you to deep dive into any specific app and track its impressions on each network in any country for the past 90 days. 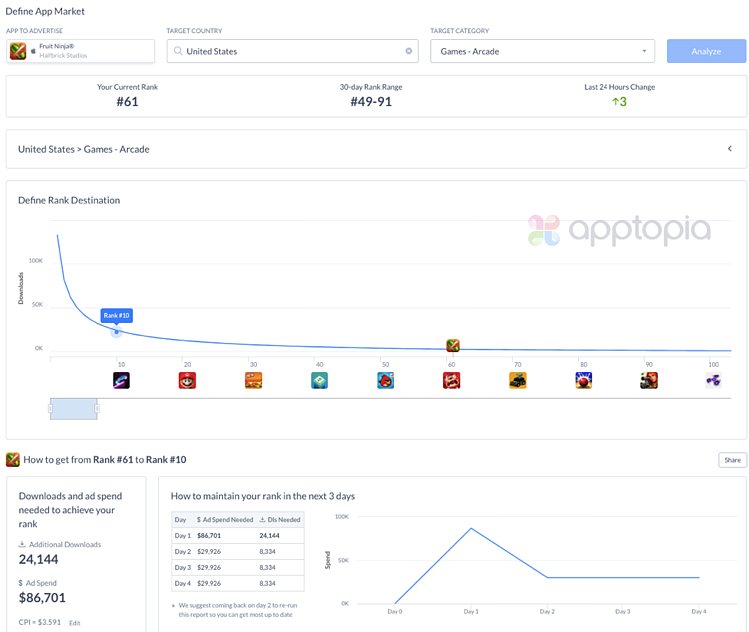 Each app’s impressions can be mapped against downloads, revenue, rank and more. You also get to see every specific ad the app is running/has run, how long it has been running/has run, and it’s share of impressions towards the whole. You can see the actual banner/interstitial ads and play the actual video ads. We now track and break out playable ads! Unsure of how much you need to spend to get to a specific rank in a specific market and stay there? Plug your desired market and rank in (CPI too if you already know your price) and we’ll tell you how much your initial and subsequent spend needs to be to achieve your goal. Where will your budget go the furthest? 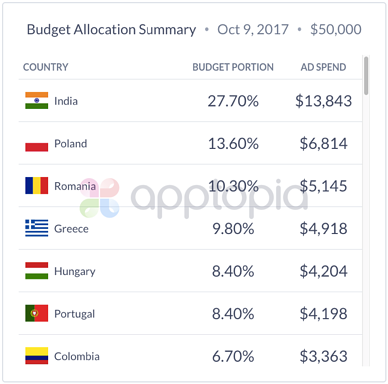 Plug in your app, at least two competitors and your 30 day budget to determine which countries you should spend what percentage of your budget in to get the most ROI. Need inspiration? Check out the creative gallery to play/view any and all ads. 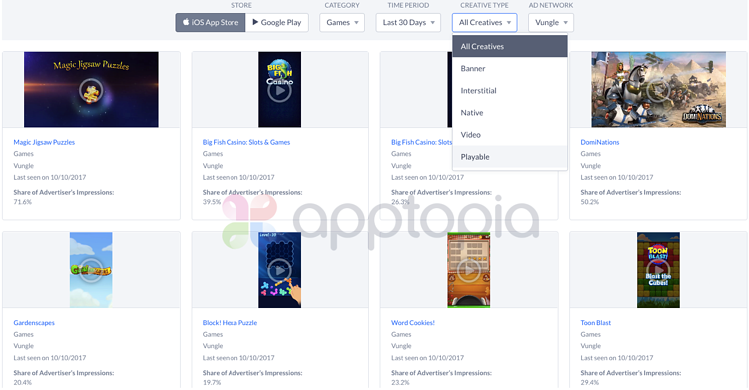 Sort by app store, store category, network, time period and creative type. 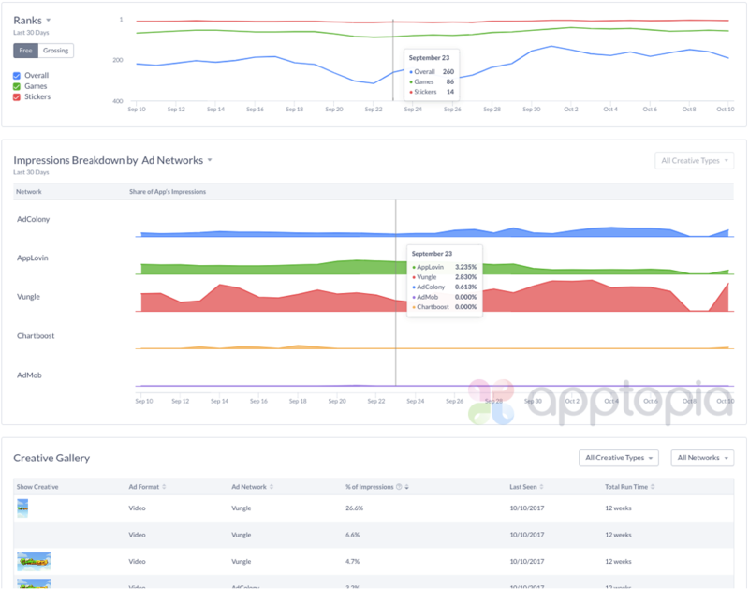 The totality of the user acquisition suite is a powerful and comprehensive toolset by itself or paired with your current Apptopia subscription.